OTTER II maintains the same cross-section as OTTER I at 1m x 1m but with a shortened overall length of 8m. The focus of this facility is on two-phase problems such as particle-laden flows, where a custom shear generator is towed through to generate turbulence in the medium. Planar and volumetric imaging techniques such as PIV and PTV are employed here. The octagonal tank offers ideal optical access for 4D-PTV measurements, with an HID light source situated beneath the tank. 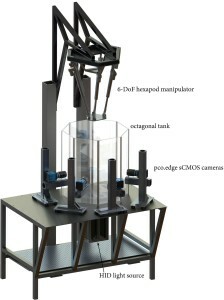 The six degree-of-freedom hexapod manipulator is used to translate and/or rotate models around arbitrary points of rotation. An ATI Gamma six-component balance is used to measure forces and moments. This large-scale, temperature-controlled flow loop provides an environment to study steady and unsteady (pulsatile) flows over a broad range of Reynolds numbers. Single-phase as well as two-phase flows – both dilute and dense suspensions – are possible via a specialized pumping system. 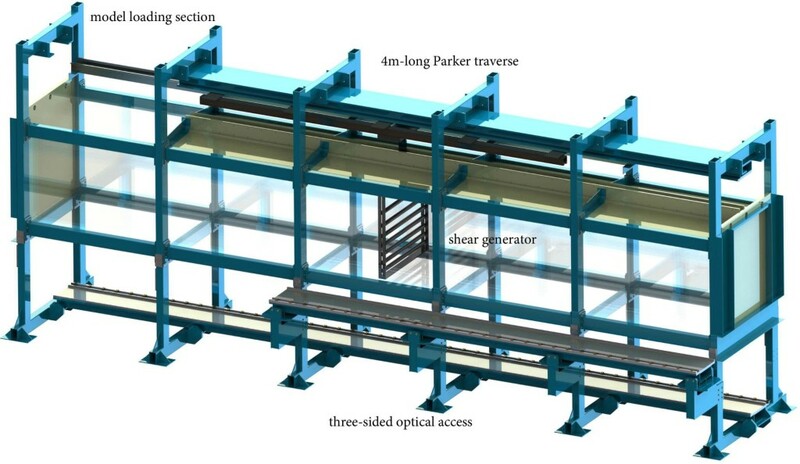 The optical test section allows for index-matched stereoscopic and tomographic reconstructions for complex geometries. Acoustic access for echo-PIV reconstructions is also foreseen.